Easily Retrieve Back your Deleted or Lost RAW NEF Images From Nikon Camera Using Nikon Photo Recovery Software! Retrieve Lost or Deleted raw NEF Photos from Nikon digital camera. Also recover other several image files format like JPG, BMP, PNG, GIF, PSD, PIC, etc. Retrieve deleted RAW .NEF and .NRW images from digital camera easily in just a few clicks. See preview of recovered photos and select the required photos from the list. Support all models of Nikon camera such as Nikon D7200/D5300/D750/D560/D3200/D3300/D3400/D7100/D7000/D5200/D550/D810/D610/D500/D600/D300, etc. For last few decades, the digital photography world has improved a lot and is still improving to cater the needs of various people with unique taste and demand. Whether you are professional photographer, photojournalist or anyone who just loves to click anything memorable, digital cameras are always handy for them. To select the best camera among several renowned camera brands is a big challenge, but with Nikon digital camera in your hand, you don’t have to think much. Nikon camera always gives you the best quality photos even if you click anything in low lights. But people very often lose their memorable pics from Nikon cameras, and in order to recover them you need advanced Nikon camera photo recovery software. What Is NEF Image File Format? Nikon digital camera primarily stores all images that it clicks in NEF (Nikon Electronic Format) format which is its RAW photo file type that provides you the high image quality. Initially, all images which are snapped with Nikon cameras are saved in camera’s memory card with (.nef) extension and they are stored in such a manner that they can easily be converted back to the generic image file types such as JPG, PNG, GIF etc, using proper software. But this RAW file types of Nikon are also susceptible to corruption or damage which cause NEF image loss and in order to restore them back you have to use either the available backup or use NEF Photo Recovery software. I took pictures and deleted them from my camera. I’ve recover my photos but they’re not being recovered. What is the best software to recover NEF raw images? If I delete pictures from the camera will the recovery program be able to find them? Accidental photo deletion is the very common scenario of photo deletion, Photo can gets deleted when user erase them accidentally while viewing photos in computer or on Nikon camera. Reformatting Memory Card – When you try to access the memory card then it displays an error message like “Memory card is not formatted” or “Card could not be recognized” etc. It means your memory card gets corrupted and all photos that stored in it will also get inaccessible. If this kind of error messages are displayed by your memory card then avoid reformatting because if you reformat it then all the stored photos gets formatted and it is not easy to recover them. Interrupted Read/Write Operation – All photos are also get inaccessible when the Read/ Write operation gets interrupted by the user. This process gets interrupted when memory card is removed during the file transferring process or power cuts while doing Read or Write operation. 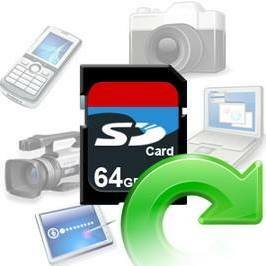 Memory card gets corrupted – This situation occurs due to the bad sectors of memory card. Bad sectors are arising on the memory card due to the unwanted power surge while accessing the photos of memory card or it may also arise because of improper camera shutdown. Virus attack – It is the most common reason of photo lost, it occurs if the memory card of the camera get infected with any kind of virus. Virus attack can corrupt the memory card and all the stored data. Computer Shutdown Accidentally while Transferring Photos to Computer – Power cut or unexpected system shutdown during image transferring can affect the memory card and make it inaccessible. Instantly Capturing of Images – When you captured images one by one without giving time to Nikon camera to store the previous images, then all the captured image gets inaccessible because this camera takes few seconds to write or store the captured image on the memory. How To Recover Deleted or Corrupted RAW NEF Photos From Nikon Camera? If you have backup of your deleted RAW NEF images of your Nikon Camera on some other location such as computer, SD card, external hard drive, etc, then you can use that backup file to restore your RAW .NEF or .NRW images from the backup files. I am sure that you might be having question in your mind – What if we do not have backup of deleted or lost NEF images? How do you recover deleted or lost RAW .NEF images from Nkon camera SD card without backup? To find out the answer continue reading the article! In absence of backup, you have left with only one option that is to use third-party Photo Recovery which is suitable Nikon NEF Photo Recovery software. This software will help you to recover deleted, lost, missing, erased, corrupted or damaged RAW NEF files from Nikon Camera. It doesn’t matter if all the captured images of your Nikon camera gets lost or deleted or corrupted due to any reasons as mentioned above or due to any other, this Nikon Camera Photo Recovery will easily scan your camera SD card and recover NEF files from SD card. This tool is very effective and simple; it recover all the images without losing the picture quality. It is the safest way to recover the unreachable or corrupted raw NEF photos. So use this advanced and sophisticated software and retrieve deleted or corrupted raw .nef Nikon camera photos. Supported Nikon Camera: Support all Nikon cameras such as Nikon D7200/D5300/D750/D560/D3200/D3300/D3400/D7100/D7000/D5200/D5500/D810/D610/D300S/D3100/D5/D500/D5000/D70/D50/D3000/D80/D800/DF/D600/D90/D600/D4S/D40/D60/D200/D3X/D700/D100/D4/D1/D5100/D3/D3S/D300/D2X/D2H/Nikon E Series and all other Nikon digital cameras available in market. Note: Stop using your Nikon digital camera and its SD card after the loss or deletion of photos or RAW NEF and NRW images. Because adding new files to the camera SD card will overwrite the existing data hence you will lose the chances for successful recovery. Below follow the step-by-step guide on how to recover deleted or lost Nikon RAW .NEF images by using photo recovery software. How to Retrieve Deleted Photos from DSLR on Windows/Mac? Use some reliable power source which can help your system to avoid sudden shutdown. Before formatting, check your storage device at least two to three times. Never use any digital device when its battery is low. Before removing the device from computer or from any other system, eject it properly. Avoid using the same device when it is already used and it is full. Keep it on safe place and do not save any new media files otherwise the previous data will be overwritten. Always protect your device from any virus or malware attack by using the perfect antivirus program. Never avoid any type of warning message because this can also be the reason for data loss. So from the above solutions I hope you were able to recover lost or deleted or corrupted RAW .NEF images of Nikon digital camera. If you have backup, then its good and you can easily get back RAW photos from backup file. But in absence of backup, it is highly recommended that you must try Photo Recovery software to recover Nikon camera RAW .NEF photos from camera SD card. 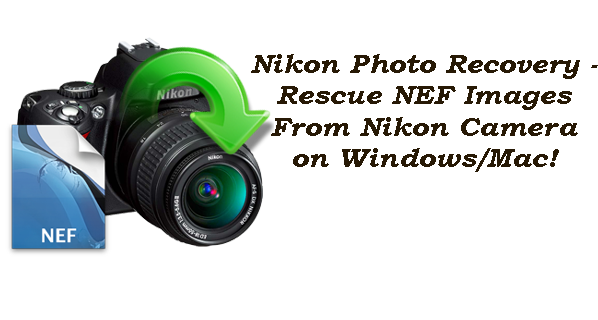 Nikon Camera Photo Recovery - Retrieve Deleted/Corrupted NEF Images on Windows/Mac! Nikon Camera Photo Recovery: Recover Deleted/Corrupted NEF Images! 1: Recover Nikon RAW NEF Image Files From Backup. 2: Recover Deleted Nikon RAW NEF Images Using NEF Photo Recovery Without Backup.